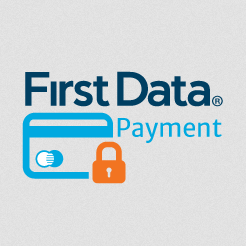 First Data payment gateway is one of the biggest payment processors that covers almost 50% of all card transactions in the United States. The First Data payment module, also known as a Payeezy gateway, provides ecommerce merchants with a powerful tool allowing customers to leverage extended payment options and save payment information for future secure transactions on online stores. With the First Data payment extension, customers will enjoy the simplicity of making online payments on your store. The extension’s functionality allows customers to save their credit cards and use them at checkout when placing new orders without the need to enter credit card details every time they shop. Besides that, store admins can also place orders instead of customers from the backend in a secure way. Let’s have a quick look at how the whole transaction processing model works with the First Data payment module integration. When making an online payment, customers can choose to use their saved cards or enter new card details. Merchant servers do not store any sensitive credit card data. Card data entered on a web store is passed to the First Data payment provider. After verifying the data, payment provider sends the data to the First Data network via API communication. 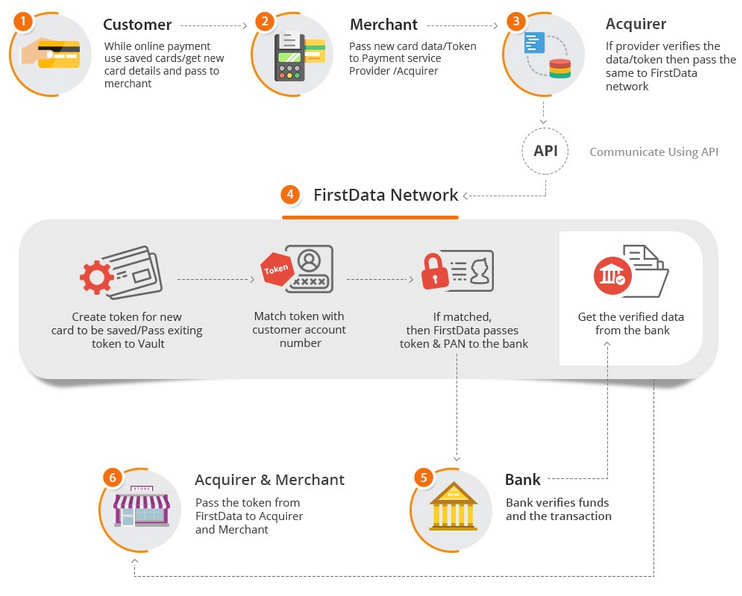 If a customer added a new card, the First Data network creates a token that is matched with a customer account number. If matching is successful, First Data transfers the token and primary account number to the bank. After the bank verifies funds and the transaction, the token is sent to a merchant site. The scheme shows how the approach, used in the First Data payment integration, brings a higher level of security in processing customer sensitive data, thus building more trust and credibility to your business. Below we provide an overview of the extension features and the benefits they bring to both customers and merchants. With the First Data payment module, customers are enabled to save the cards they use for payment at checkout and use them for future purchases. Credit cards information is stored on the First Data payment provider server, bringing the increased security of sensitive data processing and reducing the risk of technical difficulties on a merchant’s website. Customers manage and update their credit cards in My Account section of their profile. Here they can view details of their saved cards, edit and delete the cards, and add new cards to be used later at checkout. Customers are provided with various credit card types to choose from at checkout. 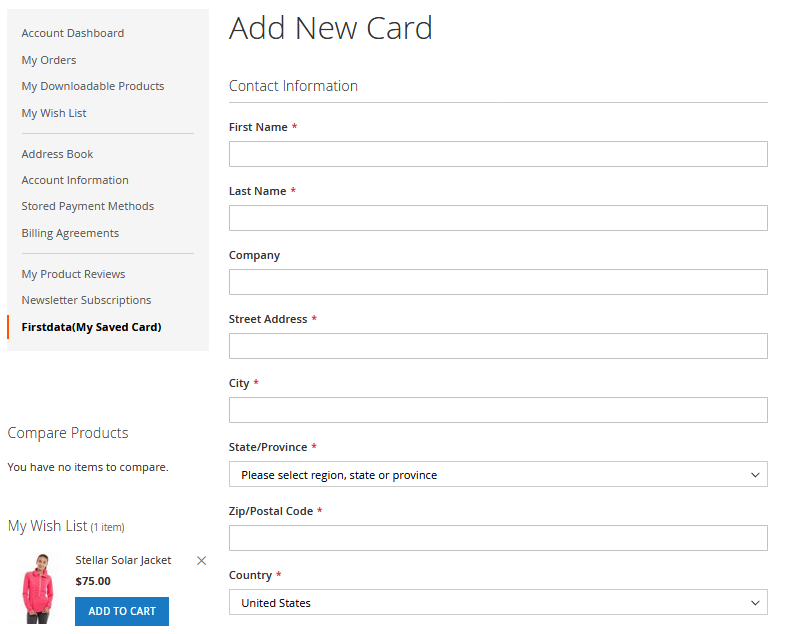 The list of available card types for making a payment can be configured in the backend. Customers can view information on their payments with the payment method details in the Order view page. 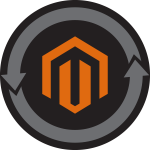 Store admins can view details of customers’ orders, as well as add, edit, and delete customers’ credit cards from the Magento Admin. 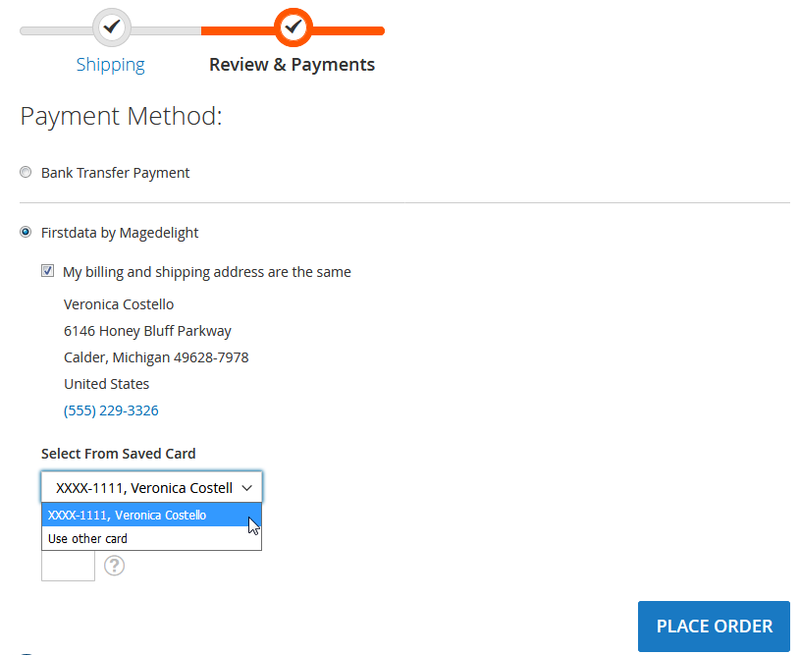 Orders can be placed in the backend, using saved credit cards on behalf of customers. If an admin places an order from the backend, they will need to enter credit card verification number to proceed. CCV verification adds protection layer and increases security against possible fraudulent actions. Admins can generate multiple invoices for a single order from the backend. Invoices can be created for different items separately or some quantity of the item, thus splitting an order. The module provides the possibility to make partial refunds, meaning that online credit memo can be generated from the backend. The First Data payment module is fully PCI compliant and does not affect a merchant’s ecommerce business security. Sensitive data on customers’ credit cards are never stored on a merchant’s server, which increases safety and protection from fraud risks. Customer data are transferred to the First Data payment provider server and then sent back to a merchant’s site as tokens. To start using First Data payment module, first, you will need to register with the First Data payment (Payeezy Gateway) provider to get your merchant account. After purchasing First Data extension and registering your account, you will receive a serial key and an activation key as part of your license. 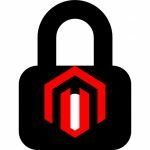 You will need to enter these two keys in the Magento admin configuration section. To access License Configuration tab, navigate to Stores → Configuration, then select MAGEDELIGHT → Firstdata Settings in the left-side menu of the page. 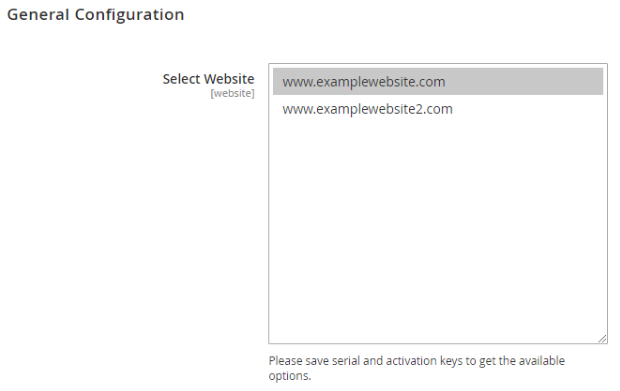 After entering and saving your serial and activation keys, you will see the available domains in the “Select Website” field of the General Configuration. You can select one or a few domain names from the displayed options. Now you can proceed with the configuration settings of the plugin. You will reach all module configuration settings if you go to Stores → Configuration and select MAGEDELIGHT → Sales → Payment Methods in the left-side menu of the page. First Data payment method will be listed in the Other Payment Methods tab. Here you can enable the plugin to display First Data payment gateway as a payment option to customers at checkout. 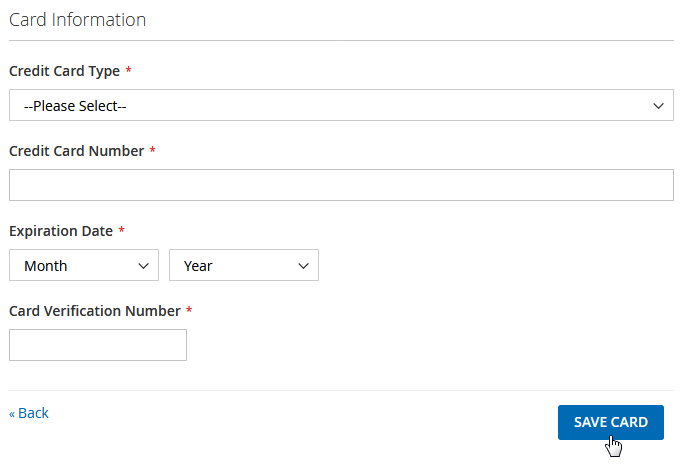 “Title” defines the name of the payment method how it will be displayed at checkout, as well as in the other sections containing payment information. In the “Gateway ID”, “Gateway Password”, “Key ID”, and “HMAC Key” fields, you should insert the credentials associated with your merchant account. If you want to check how the module works on your online shop in the Development environment, select Yes in the “Test Mode”. When you want the module to go live on your web store, select No for the “Test Mode”. In the “Payment Action” settings admins can choose between “Authorize” and “Authorize and Capture” options. With the “Authorize” payment action, the payment amount will only be authorised without sending it to a merchant bank when a customer places an order. “Authorize and Capture” action allows immediate capture of the payment amount and creation of the invoice after successful order placement. 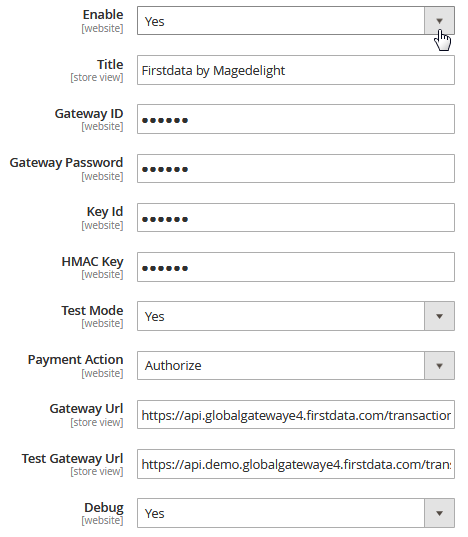 “Gateway Url” and “Test Gateway Url” fields contain the URL links of the First Data payment module, whether for live more or test mode. You can enable or disable debugging in the “Debug” setting depending on the environment used on your web store. In the “Credit Card Types” you decide which credit cards to allow customers to use for payments on your store. Enabling “Credit Card Verification” will add the field for credit card code verification at checkout. “Save Optional” setting defines how customers will be able to save credit cards they use for payment. 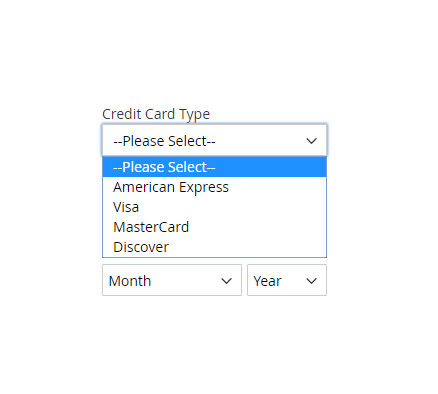 If you select “No” here, all the credit cards customers use will be saved by default in their account. If you choose “Yes”, it will give customers an option whether to save or not the card used at checkout. “New Order Status” assigns a status to order after its successful processing and provides two options to choose from, Processing or Suspected Fraud. 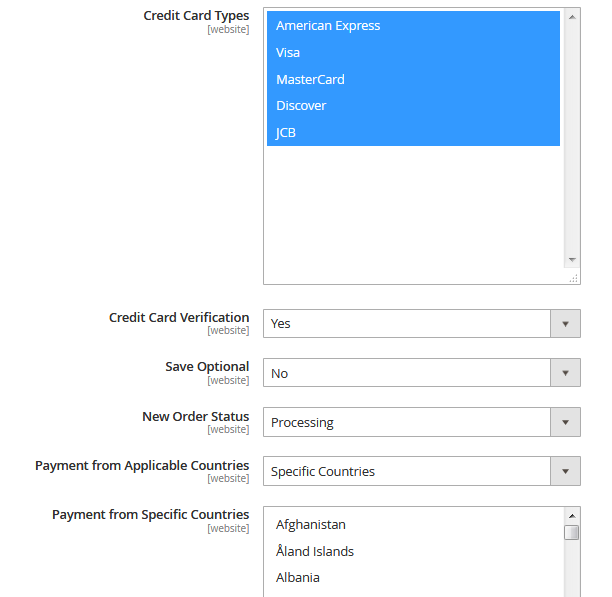 With the module, you can decide from which countries you want to accept payments on your store in the “Payment from Applicable Countries” setting. If you choose Specific Countries here, then you will need to specify the countries. Depending on the value specified in the “Minimum Order Total”, First Data payment method will be visible only if the minimum order total is equal or more than that value. As for the “Maximum Order Total”, payment method will be shown if maximum order total is less than the amount specified here. “Sort Order” will show First Data payment option on the checkout page according to the sort order set. The module also provides you with the option to delete the information of all cards saved in the admin. If you click on “Delete Cards”, it will remove all records of the cards associated with your current Merchant ID. You might need to use this function if you decide to edit your merchant details for some reason. With the First Data payment extension, store admins can view all transaction details for each order. Payment transaction information is stored under Sales → Orders menu. Here you can access the Order grid with the payment details customers used to place their orders on your web store. 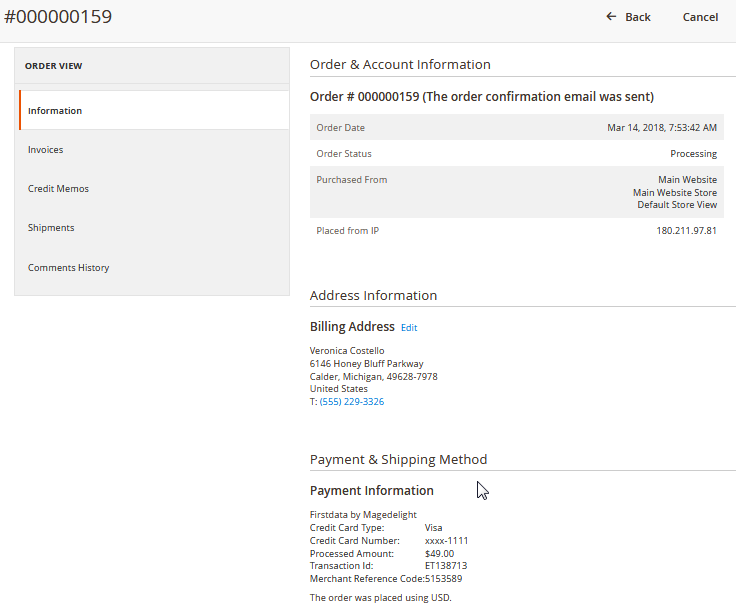 By clicking “View” in the relevant order row, you will open payment details related to the order under the Payment & Shipping Method tab on the Order View page. Store admins are also enabled to manage saved cards on behalf of the customers. To view and manage the list of the credit cards saved by a customer, navigate to Customers → All Customers in the Magento Admin and click Edit for the relevant customer record in the Customers grid. The First Data payment extension adds a new tab, Saved Firstdata Cards, to the Customer Information section. Here you can view the cards saved by a customer, edit and delete them, as well as add new card details on behalf of a customer. On the Customer Information page, admins can also place an order using the saved card on behalf of a customer by clicking “Create Order”. Since admin will have to enter a customer’s credit card verification number to place an order instead of a customer, it puts additional protection layer on orders from fraudulent actions. One of the great features of the First Data payment module is that it does not redirect customers to the First Data payment provider to process transactions. Due to the tokenisation model, credit card details are collected to process the payment within your store, and your customers feel like they never leave your website. After a customer clicks on “Proceed to Checkout” button in their shopping cart, they will see First Data payment gateway listed among other payment options on the checkout page. When making a payment, customers can choose to use their saved card. 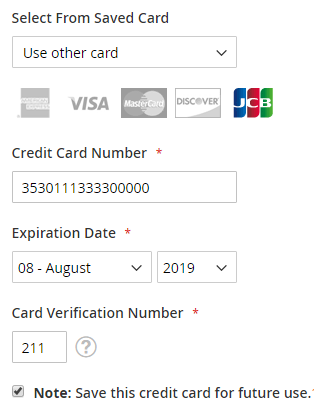 Other option to make a payment for a customer is to enter details of a new card, that can be saved for future payment transactions with one click during checkout. Depending on credit card types configuration in the backend, customers have different card payment options in the drop-down menu at checkout. Customers can easily manage their credit cards in My Account profile. The list of saved cards is located under My Account → Firstdata (My Saved Card). 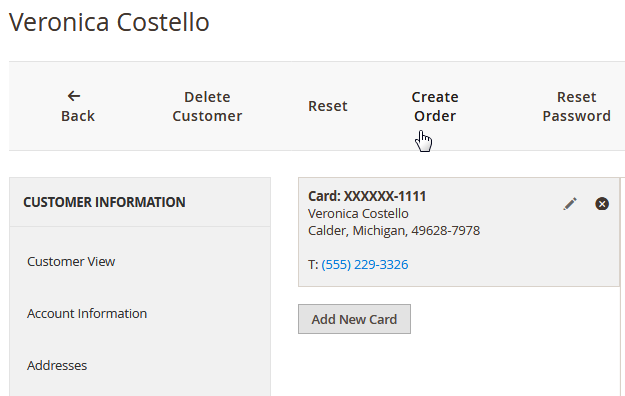 Here customers can view their cards information, edit and delete cards, as well as add new cards. To add new cards that can be used at checkout later, a user should click on the “Add New Card” button. After entering contact information and credit card details, customers should click “Save Card” to add a new card to their list. 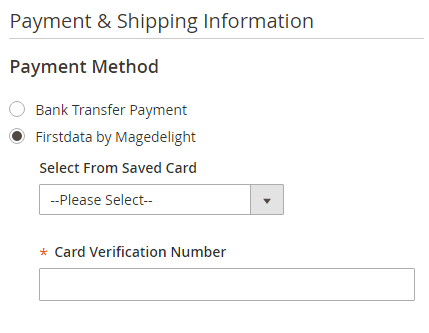 MageDelight First Data payment module for Magento 2 is a robust tool for improving customer shopping experience and protecting online stores with a higher level of security. With the First Data payment integration, merchants can process secure and reliable transactions without storing customers’ sensitive data and increase the credibility of their web stores. The First Data payment extension’s price is $249. The extension package includes free lifetime updates, free customer support for 180 days, and a money-back guarantee for 45 days. Installation service and extended support can be purchased for the extra price. 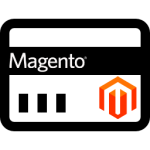 MageDelight works with the certified Magento developers, who follow strict coding standards when developing their extensions, ensuring that everything runs smoothly on your website.